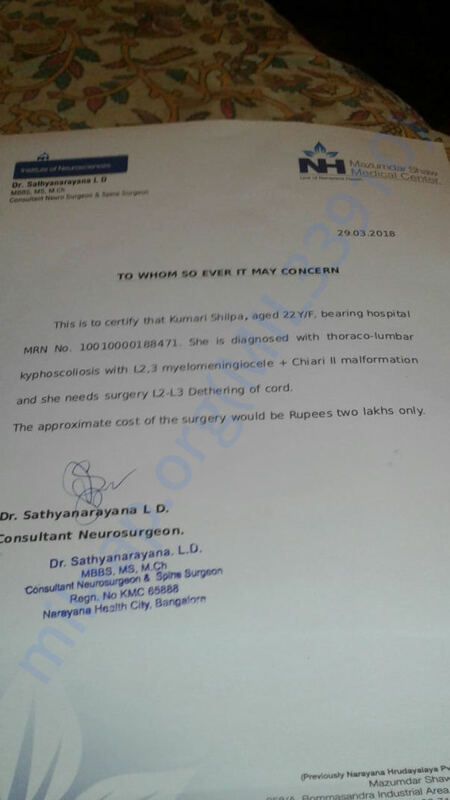 18 year girl named Shilpa Reddy from Bengaluru is suffering from spinal cord problem. 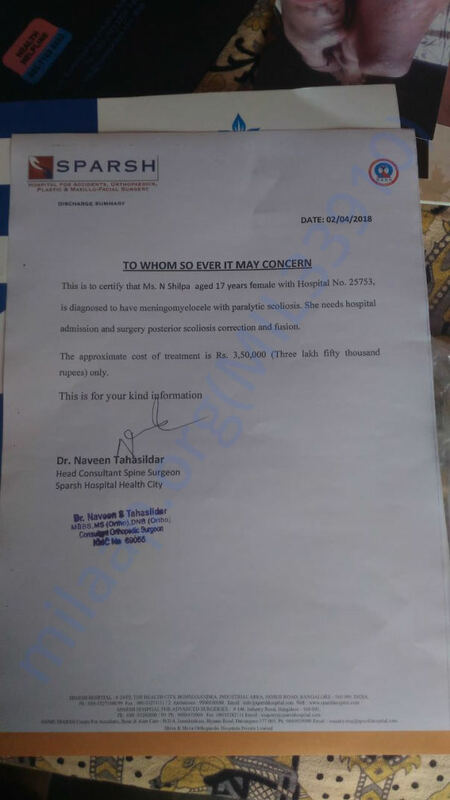 She needs surgeries to be done in two different hospitals immediately which costs 4.8 lakhs. The family cannot afford the treatment and are looking for financial support. Karnataka CM has given them INR 1L from the CM's Fund for the treatment. She needs surgery immediately to help her get back on her feet. So donate as much as u can and save her please. She is receiving some support from Actor Mahesh Babu's Fan Club as well. Lets support her family and help her get treatment. Thank you for the love and support you have shown towards Shilpa. Here is a quick update on her health. She has to undergo two more operations. She will be admitted for the second operation within the next ten days. Once that is done, doctors will be able to decide on the further treatment required. Please pray for her health and speedy recovery. Keep sharing this campaign. Shilpa is currently doing okay and still needs to undergo two more operations in order to help her recover. She will now on medication until enough funds are collected to support her treatment. Please keep supporting her so we can provide her the necessary treatment. We shall be increasing the goal amount for the same. Thank you once again! We shall keep you posted. Shilpa's first surgery is done in Narayana hrudayalaya a week ago. Withdrawn funds will be utilized to initiate the second surgery in Sparsh hospitals which is to be done after 10-12 days. Will keep you posted as her health progresses.